Many of you know that, for a long time, my eyeglasses were my logo. I am very picky about my glasses - they reflect who I am to the world more than anything else. So when lately, someone said to me "your glasses are too flashy" - it truly gave me a moment of reflection. Ever since I hit 40 years old, I really down-turned all excess and flashiness and ever bright colors (save for one Faconnable shirt and one Versace t-shirt which have deep emotional values). The rest was muted colors - navy, black, grey. So suddenly I embarked on a mission - finding myself a new pair of glasses which would not be flashy (but which would still be sophisticated enough to still reflect me). Well, I am not an introverted shopper for nothing - I roamed places and shops and online until I fell on a potential brand I liked: The upscale Lindberg. So I contacted several shops online, and as usual, few even bother to reply - you would be surprised how many shops do not even bother to reply to inquiries online, or worse as it happened with a major upscale retailer, do not acknowledge several emails telling them their website is down. But Visique did reply - and extensively. And then when I finally zeroed in on a model they told me it was available in black and grey. My thinking was - "wow, these people know their stock, are polite online so let me visit their shop". And indeed, I visited, all while there was a woman shopper who obviously had an advantage over, yet the girls there found enough time for me, showed obvious preference of one frame over the next and were very courteous in their dealing. Eventually, I adjourned my Lindberg project till end of the year. But as luck would have it, on November 22nd I fell in love with a pair I saw online. A vintage, 140 years old deadscok frame. My close friend in Amsterdam got it for me, had it delivered to London to a friend coming for the Holidays and eventually, I got it several days before Christmas. I went back to Visique to equip it with glasses, and - it turned out there was a problem. 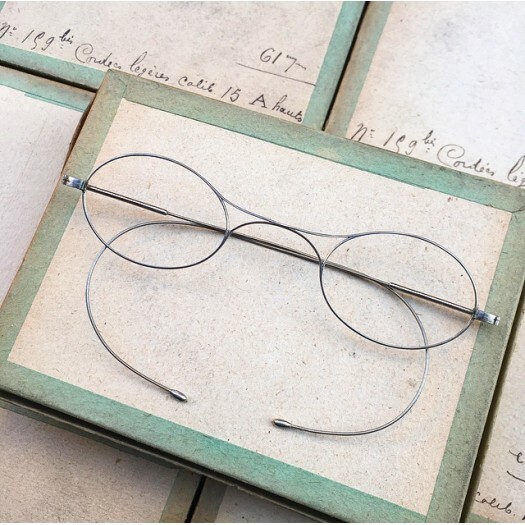 The frame came without glasses, meaning glasses had to be measured and created from scratch. Still, I was advised on three different kinds of glass, the pros and cons of each and never did I feel that they were leading me to the more expensive choices (considering I work in communication I can decipher all the tricks used). However since I panic at things like that (creating glasses from scratch - especially that it tuned out the first atelier they contacted could not do the job), it is truly a testimony of how professional Visique is because the process seemed extremely simple, and I was updated regularly as to what happening till eventually getting the finalized glasses in hand! Even after the transaction finished, several days later, I got an SMS from them hoping "I was happy with (their) service". I am! Trust me! As everyone knows I am not a blog that accepts endorsements or what not so it is truly to the credit of Visique and their kind and professional staff that I am writing this. Visique does enjoy glowing reviews online, so probably mine is just "one more", still as a very satisfied customer, I want my own experience to be heard.